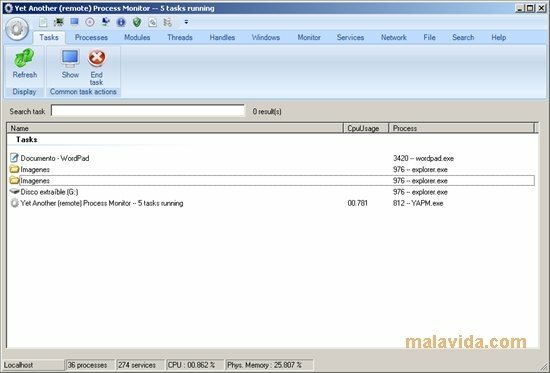 Yet Another Process Monitor (YAPM) is a powerful open source tool that allows us to view and manage all the tasks, processes, threads, modules, windows, services and open network connections both on our computer as well as on another PC through remote access. The amount of operations and functions that we can carry out with this program is incredible, outstripping the majority of pay options. Among other things, YAPM has a memory manager, dependency viewer, a privilege manager and a complete statistics service. We will also be able to use it to detect rootkits, manage the system windows and create keyboard shortcuts. To an incredibly written application, this program adds one of the best graphical user interfaces (GUI) of this kind of software. Its default design presents an aesthetic that resembles that of Office 2007 and its "ribbons", big buttons that make it easier to use, which is appreciated in a tool like Yet Another Process Monitor. Despite what its name indicates, it isn't just "another process monitor". It's one of the best options that we can choose from this kind of application, as well as having the even more favorable feature of being open source and completely free. It requires that you have .NET Framework 2.0 or above installed. It only works on 32-bit systems.